Studies in men suggest no effect of the hormonal response on training outcome - What about women? A news study provides insights that may be relevant for both female and male gymrats. It has been a few years that I last wrote about the "hormonal ghost". Back in the day, Stuart M. Phillips published an excellent paper that debunked the myth of a mechanistic link of post-exercise increases in testosterone, growth hormone, IGF-1 and co., on the one hand, and exercise-induced strength and size gains, on the other hand. And for those for whom Phillip's review of the literature was not convincing enough, Daniel WD West's 2012, which showed none of the expected associations between exercise-induced hormone profiles (first and foremost higher post-workout testosterone levels) and the rate or significance of muscle strength and size gains in a large cohort of young men after weight training, should have been evidence enough to stop believing in "hormonal ghosts", but alas... you will probably know that "training for testosterone increases" is still en vogue. That's stupid stubbornness, nothing else, right? Well, even though I don't believe in ghosts, I have to admit that a closer look at West's data will have you reject the hypothesis that the post-workout testosterone response would augment size gains, it does yet also show other hormonal changes do correlate with the changes in the study's subjects' lean mass (Figure 1, left) as well as type I (middle) and type II fiber size increases (Figure 1, middle & right). Figure 1: Sign. associations between PWO hormone levels and lean mass, as well as fiber size increases (West. 2012). 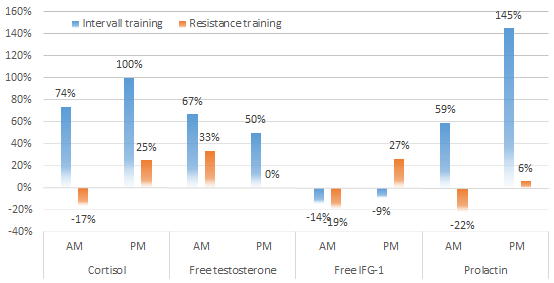 Figure 2: Changes in anabolic and catabolic hormones in response to AM and PM HIIT and RT training (Toon. 2015). In a series of experiments Rebecca Toone conducted for her thesis, she re-addressed the issue of the acute hormonal effects on performance with female study participants (yes, a long-term study was not part of her thesis, but I promise, the results are still noteworthy). Higher sprint cadence (RPM) during HIIT, higher increase in DHT in the female study participants (Toon. 2015). DHT another acute phase reactant? 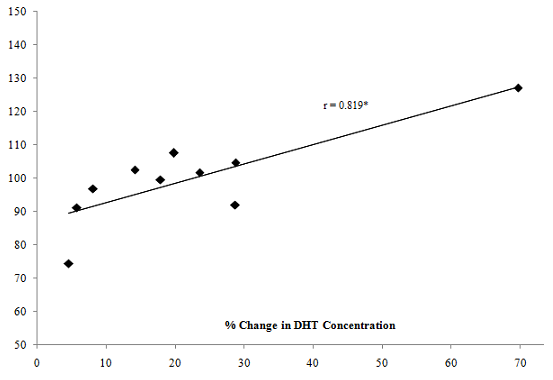 Even though the overall results of the study suggest that increased pre- vs. post workout changes in DHT as Toone observed the with higher RPM-numbers during HIIT sprints are not the reason, but rather the consequences of training at higher intensities, it is worth mentioning that this is the first study to observe the existence of an association between DHT and HIIT performance in women and that the results are in line with the results of previous research suggesting that DHT, not its precursor, testosterone, has a direct influence on skeletal muscle force production in vitro. "[...] it could be beneficial to perform resistance training in the afternoon preceded by interval exercise in the morning in order to stimulate a hormonal milieu that may be more conducive to stimulating muscle protein turnover" (Toon. 2015). If you scrutinize the data in Figure 2, you can see that this hypothesis is warranted, because of the differential response of the anabolic hormones, testosterone and IGF-1, and the stress / catabolic hormones, cortisol and prolactin, she observed in her young female subjects. Against that background it is quite interesting that Toone's last and most important experiment, in which she investigating the potential acute effects of hormones on performance, failed to demonstrate a direct correlation between changes in testosterone or other "anabolic" hormones and her subjects' performance. "The trial consisted of a 20 min effort at a target power of 80% of the average power obtained during the maximal 20 min TT, followed by a 5 min break, before completion of a bout of repeated sprint interval cycle exercise consisting of 10 x 30 s sprinting, with 90 s recovery. The session was self-paced with real-time numerical feedback provided on elapsed time, cadence and power. Participants were given verbal encouragement at specific time-points throughout the trial. The same protocol was repeated for the second main trial one week later. Participants were permitted to drink water ad libitum throughout the trials. Trials were completed in a group setting as a group of six and a group of eight. A trial timeline schematic is displayed [in Figure 3]" (Toon. 2015). Instead, the results of the previously described exercise test point towards affective variables, i.e. mood and effort, as the factors that mediate any link between hormonal changes and performance markers during an acute bout of high intensity cycling. Figure 3: Design of the last and most important experiment of the study (Toone. 2015). And guess what, the effort Toone's subjects invested into their workouts was not just a predictor of their performance, it was also positively associated with the percent change in testosterone concentration from post-sprint 4 to post-exercise (r = 0.449; P < 0.01). Note: We are till talking about associations and correlations. That one of these, e.g. the one between the effort we put into our workouts and the preformance and hormonal response exists because of a causal link is thus in view of the results of the study at hand logical, but still hypothetical. As I am about to point out in the bottom line, future studies will have to investigate that - even though I have to admit that it will be difficult to develop an effective design for these studies. In conjunction with the subjects' affect, which was inversely correlated with the rate of perceived exertion, which in turn showed positive correlations with cortisol, the results highlight a previously overlooked role of effort and affect when it comes to both, exercise performance and its effect on certain hormones. Figure 4: The hormonal response is rather the consequence than the trigger of acute performance. Or as Toone has it in her interpretation of these somewhat surprising results: The acute short-term effects of hormone concentrations on performance may be more related to mood and behaviour" than the actual type / time of exercise in the context of her study. What does that mean? Practically speaking this would confirm what I have said about the initially cited West study in several previous SuppVersity articles. In said study, cortisol probably has no mechanistic effect on muscle size. Rather than that, the increase in cortisol could serve as a measure of how much effort the subjects put into their workouts; and this, in turn, determined their muscle gains (more effort = bigger growth stimulus = greater gains). The meager and transient increase in testosterone after your workouts has none of the muscle building and fat shedding effects of exogenous testosterone. The latter however, can turn back the time and an aging pouch into a true best-ager | learn more. In the study at hand, the situation appears to be similar. Mood and effort determine performance and hormonal response of the female study participants. Accordingly, there may be associations between exercise performance and certain hormones, but those are of corollary, not causative nature. In the absence of an additional experiment that would investigate the correlations and associations between mood, effort, RPE, hormones and the exercise-induced adaptation in the long run, we can still only speculate that making the workouts more fun and stimulating maximal effort would promote both, the adaptive response and the hormonal response and thus confirm that mood and effort are in fact the most relevant determinants of the outcome of your workouts | Comment! Phillips, Stuart M. "Strength and hypertrophy with resistance training: chasing a hormonal ghost." European journal of applied physiology 112.5 (2012): 1981-1983. Toone, Rebecca. Assessing the Hormone Response to High Intensity Exercise and Identifying Associations with Performance. Diss. University of Bath, 2015.